There are certain parts of a computer that you definitely do not want to skimp on, and the power supply is at the top of the list. A bad power supply can literally destroy your whole computer. Power supplies that produce too much voltage, too little voltage, inconsistent voltage, or that bleed AC into the DC can all damage your computer's delicate components. That's why I only use power supplies from industry-leading companies like Antec, Cooler Master (shown in this picture), and Thermaltake. I'm sure there are many other companies who make excellent power supplies; but Antec, Cooler Master, and Thermaltake have never disappointed me, so I've been loyal to them for many years. Cooler Master is my personal favorite, but all three companies are top-notch. In addition to choosing a high-quality power supply, it's also critical to choose one that is efficient, that fits in your case (form factor), that produces adequate power for your computer's current and future needs, and that has enough of the correct connectors for the type of system you are building. Let's look at all these factors individually. In simple terms, the efficiency of a power supply refers to what percentage of the input wattage is converted to output wattage rather than heat. To determine the efficiency, simply divide the output wattage by the input wattage. For example, if a power supply draws 600 Watts on the input side to produce 500 Watts on the output side, that power supply is 83.3 percent efficient (500 ÷ 600). Wattage is voltage multiplied by amperage. Because the input voltage is constant, the component of wattage that changes with load is the amperage, or "current." Because various metallurgical and electrical factors that affect efficiency are current-dependent, power supplies usually have different efficiencies at different loads. So how do we determine how efficient a power supply is overall? The 80 PLUS standard simplifies power supply efficiency ratings by looking at their efficiency at 20 percent, 50 percent, and 100 percent of their rated loads. Power supplies certified to be at least 80 percent efficient at all three levels are allowed to label and market them as 80 PLUS-compliant. Companies who certify that their power supplies meet additional efficiency standards at load levels of 20 percent, 50 percent, and 100 percent of their rated loads are additionally allowed to label and market them with "metal" ratings ranging from Bronze to Platinum. The "Titanium" rating has an additional requirement that the power supply be at least 90&percnt; efficient at 10 percent load. Choosing an efficient power supply will save you money on electricity, reduce your carbon footprint, and reduce the total heat produced by your computer. It's also a rough indicator of a power supply's quality: It's more difficult and requires better-quality materials to produce a high-efficiency power supply than a low-efficiency one. 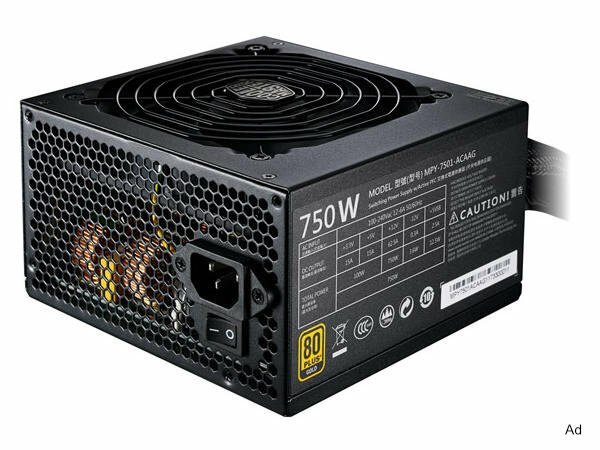 Most high-end power supplies for hobbyists nowadays have an "80 PLUS Gold" rating. In a perfect world, a power supply designed for a specific form-factor case would fit in any case using that form factor. In practice, double check to make sure. One common conflict is that the power supply is too long to fit behind the top bays of the case that are usually used for optical drives. You're going to have to do some research and some math to determine how big a power supply you need. The simple answer is that it's the sum of how much power all of your computer's components consume at their maximum load levels, plus a margin for headroom. The maximum power consumption will be in the specifications for the parts you choose. Make sure to jot down this information while you're planning your computer and looking at parts. "Headroom" in this context means an additional margin of power that we never intend to actually use. The main reason we want some headroom is to avoid the power supply ever having to work at its maximum possible output. Electrical components burn out more quickly when they're constantly working their hardest. Having some headroom prevents that from happening. It also provides a margin for components that consume more power than their specifications say they do, and allows a bit of room for future expansion. When I'm building a system, I look up the maximum power requirements for literally every component I plan to install, add them all up, and then add at least 25 percent for headroom. I really prefer more. If I think I will be upgrading the system in the future, I add more like 50 percent. Computer components use a variety of connectors. You'll need SATA-type power connectors for the drives, the ATX connector to the motherboard, probably an 8-pin connector or two for the processor and video card, a PCIe cable, maybe a Molex or two, and possibly others depending on your computer's build. You also need to decide whether you want to use a non-modular, semi-modular, or full-modular power supply. Once upon a time, power supplies all came with all the cables you could possibly need permanently attached to the power supply. Nowadays, these kinds of power supplied are called non-modular power supplies. They're convenient because it's highly unlikely that you won't have a cable that you need. But that also means that you'll have more unused cables to tie off so they don't block the airflow inside the case. At the opposite end of the spectrum we find full-modular power supplies. They come with nothing attached to them. They have outputs into which you plug only the cables you need. They usually include an assortment of the most common cables needed to build a "typical" PC, but check first to make sure. You may need to buy additional cables. In between the two extremes we find semi-modular power supplies. The ATX connector and possibly other motherboard connectors are permanently attached to the PSU, but any others you'll need to attach yourself. Like full-modular power supplies, they usually include a sensible assortment of cables for a typical build, but check first to make sure. As I mentioned earlier, the power supply is not a place to look for a bargain. Do yourself and your computer a favor by buying a high-quality power supply to protect your system from damage.